Go big with the boho style of the Large Funky Floral Thinlits Die Set. 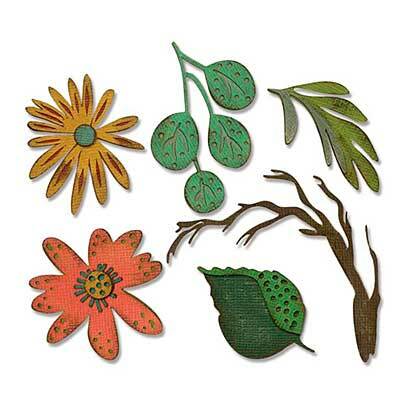 Sized just right for home d�cor, wearables and mixed media projects, this assortment of layered flowers, leaves and branches are a fun way to add a natural element to your makes. Perfect for springtime card making, and autumn scrapbook layouts. Package includes: 6 wafer thin dies that range in dimensions from 0.375" x 0.375" to 2" x 1.875".